Deque University offers training for every level of expertise and every area expertise in digital accessibility. Learn web and mobile accessibility skills at your own pace. 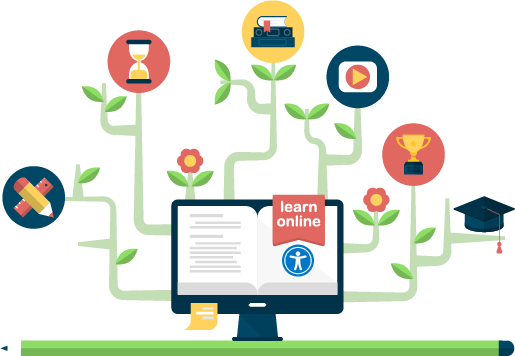 Deque University provides an extensive curriculum of self-guided online courses so you can focus on the skills you need with the flexibility your schedule requires. Whether you’re working on your own professional development or training a team, make Deque U your go-to resource for in-depth accessibility expertise. If you have a team in need of accessibility training, check out our Instructor-Led courses and workshops. One of our experts will provide live training in person or via teleconference, giving your team a chance to engage with their instructor, ask questions, and address accessibility challenges specific to your organization. Talk to a Deque Team Member about your training needs. The world needs more accessibility experts, and people with disabilities are already experts in inaccessible experiences. With a little additional training, you can build the skills you need to become an accessibility specialist and help bring the world closer to digital equality. If you have a disability, you qualify for a scholarship for free access to Deque University’s online, in-depth digital accessibility curriculum for one full year. Interested in getting certified with the International Association of Accessibility Professionals? Deque is an Approved Certification Preparation Provider, and we offer Deque University online courses for CPACC and WAS exam preparation. Deque U courses also apply as continuing education courses towards your existing IAAP certification. Visit the IAAP website to learn more about the exams including exam dates and registration.